When it comes to co-ordinate motion puzzles, the master is generally regarded as Vinco, however Gregory Benedetti has been doing a lot of work in creating clever dissections which require co-ordinate motion. I was lucky enough to pick up a couple of his puzzles last year from Bernhard over at Puzzlewood. Seems that I've had them long enough that I should really write about them! Gregory himself admits that he was influenced by Vinco, and his work on co-ordinate motion puzzles, which gave him the push to try to create some co-ordinate motion puzzles himself. There's a great interview by fellow blogger Saul on his blog Seeking Ariadnes Thread with Gregory if you'd like to read about Gregory's thoughts. It's a great read and I highly recommend it. The first, and smaller of the two puzzles is "Little Slide Plank" which is about as minimal as you can get from a co-ordinate motion puzzle. 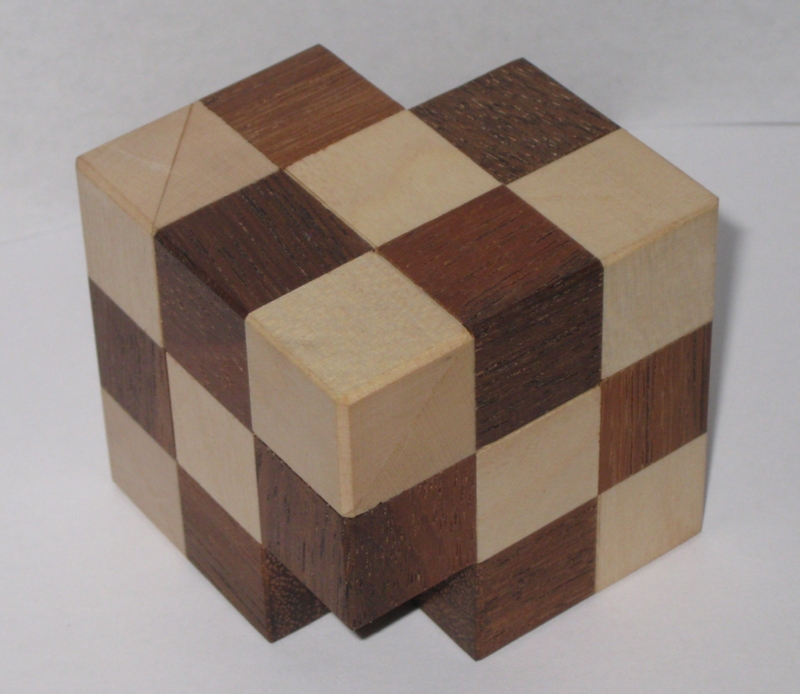 This three piece, 2x2 cube with one small void in the centre is a pretty elegant puzzle. It's only 2" cubed, made with a contrasting wood for the planks. If I were to guess, I'd say Ash for the main pieces, and Mahogany for the planks. While many people shy away from co-ordinate motion puzzles due to the challenge of reassembling them, this is great for any level of puzzler. The unique dissection leaves you with some very interestingly shaped pieces, and while it's not difficult to take apart or re-assemble, it has that fiddle factor that makes a great puzzle. You just want to pick it up and play with it. The other design from Gregory is his "6 Piece Cube". Interestingly, this cube is missing a couple of cubies, meaning it's not really a cube, but I'll not fault the design name based on that. Those missing cubies are very useful! 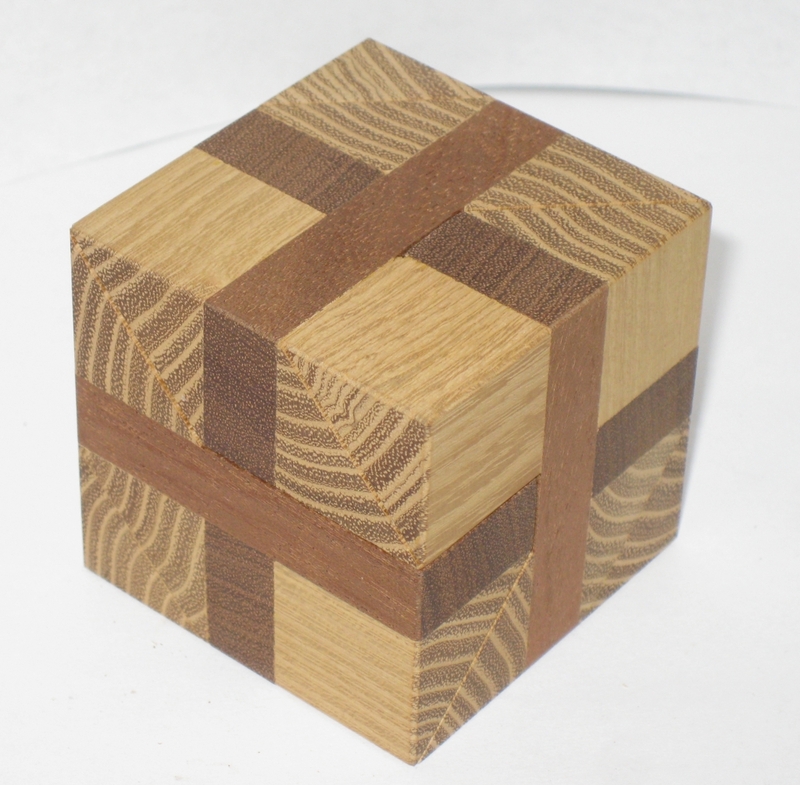 This is the slightly larger of the two puzzles, at just under 2.5" cubed made from walnut and Maple, the contrast of the checkerboard appearance is a good look. Being a six piece puzzle, the difficulty in this one does go up a notch. Finding the correct grip on the puzzle to allow the pieces to start sliding past each other can be challenging until you know how to hold the puzzle, as often you'll find a finger is blocking the motion you need. Remember I said those missing cubies were useful? Once you find the correct axis, the pieces will side past each other, creating some interesting triangular geometry in the voids between pieces. As with any other co-ordinate motion, the puzzle expands in size, right up tot the point where it falls apart in your lap. My copy is very well made, with excellent tolerances. 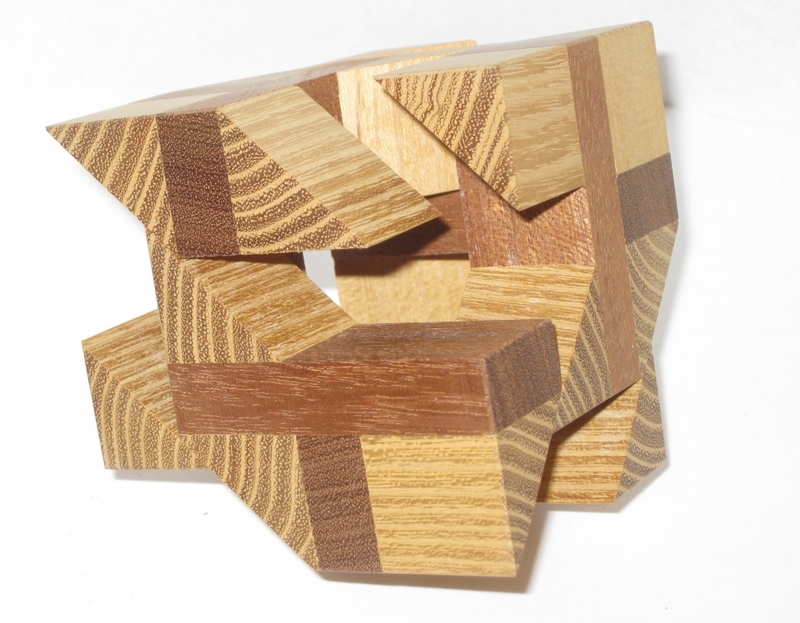 The puzzle is tight as it expands, allowing the pieces to hold onto each other until the very last fibers before they crumble into a pile of six pieces. 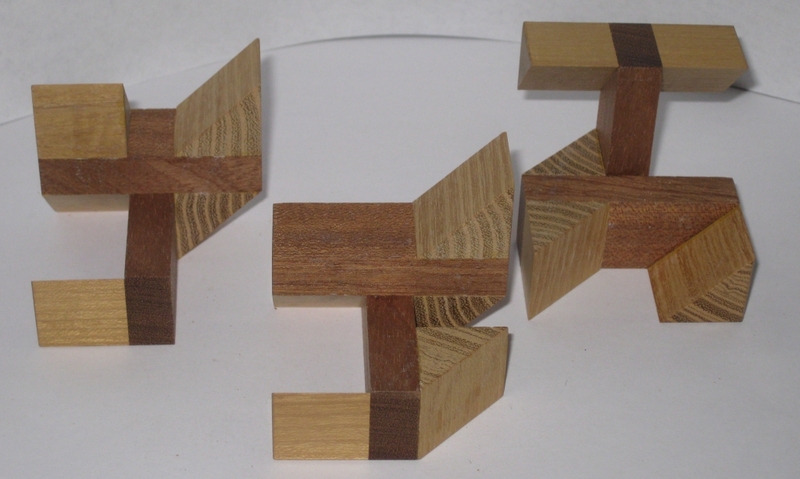 The pieces in this puzzle are made from two sets of congruent pieces. 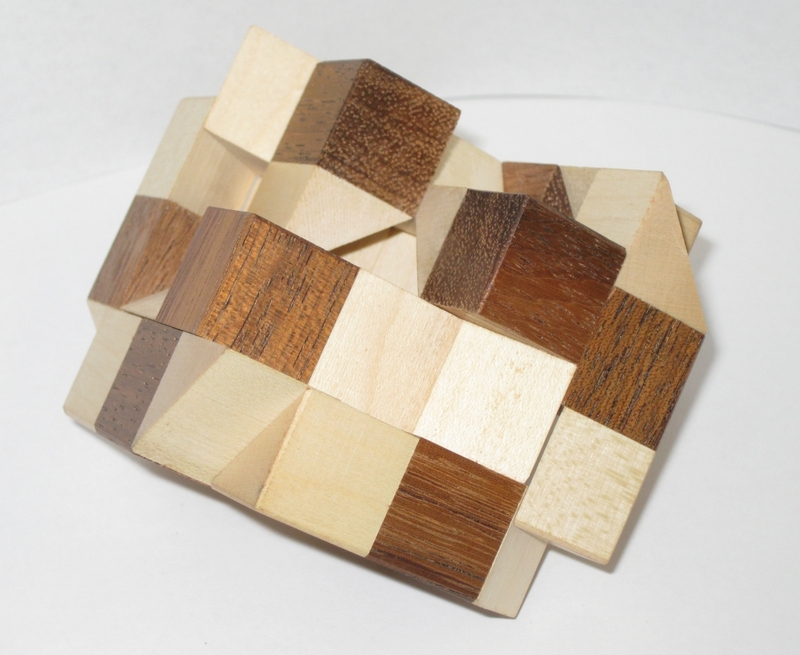 It's not too hard to see how the pieces go back together, however with six pieces, it takes a little longer than it does with the first puzzle. Then the real challenge starts. Once you have found the correct orientation, getting all the pieces back together is far more challenging. The puzzle needs to be expanded to near collapse to allow a piece to be inserted, and the easiest way I found was to add one piece at a time ... so I had to do this more than once, and try not to mishandle a piece and put myself right back to the start of the assembly. It's a much more challenging puzzle, but has a great motion as it comes apart, and is achievable by most people. An experienced puzzler should have no problems, and will enjoy the interesting geometry in the puzzle. 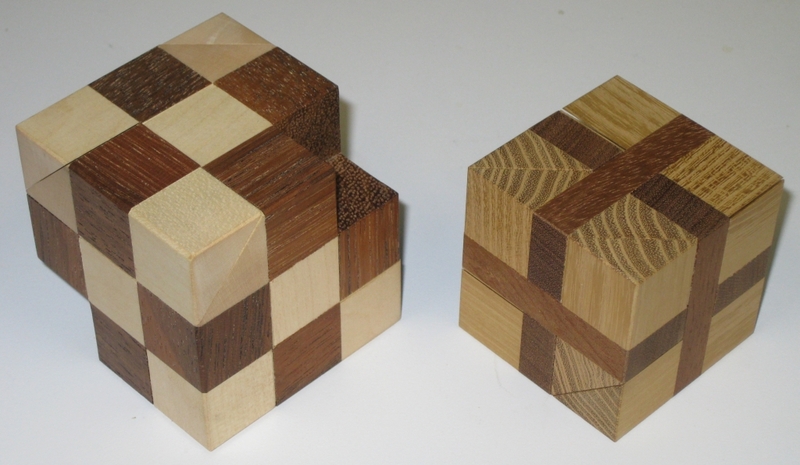 I do hope Gregory continues his exploration of the co-ordinate motions, as these two puzzles are a great start! Nice find! I have quite a few of these from Vinco and my only issue is that many are based on the same mechanism. I may have a chat with Bernhard to add these to my collection. Incidentally I think the wood in little slide plank may be Robinia – I see it used a lot by Eastern European craftsmen. All Vinco i had try are based on the same mechanism. Not really difficult, but Vinco is a really skilled craftsmen and all are well made. If you like Gregory’s design, try the BLIND BURR. (http://www.puzzle-place.com/wiki/Blind_Burr). I think it’s a very good design. You can even read a review of the Blind Burr if you’re interested. It’s a great puzzle.